Our conference gathered 250 people from 5 states, 25 colleges, 25 nonprofits, 40 businesses, 50 Massachusetts communities and more. The conference was full. Good mix of people attending, choices of workshops, keynote address, and zero-waste event. Excellent lunch! I liked the content, positive energy, and diverse group of people. Walking tour of green infrastructure was good. Wide variety of presentations and exhibits by notable speakers and organizations. Good opportunity for networking with people and organizations from the region with similar interests or concerns. As a facility manager I was more interested in the sustainable campus side of the conference. However, upon reflection I was glad that the keynote speaker talked about climate change and sea level rise. The presenters were all very knowledgeable, and the folks in attendance were friendly and engaged. As a whole it was a great event. Our town is updating its Community Development Plan and the update needs to address climate change and storm impacts on the town’s infrastructure. The conference provided numerous resources for this project. As a student looking to enter the workforce, attending the Eco-Career forecasts talk was useful to me, as the presenter noted key points one should emphasize in their resumes and the need for specialization. I got a lot of insight into sustainability and the difference approaches you can take to do your part in the environment. As a result, I will be looking for other groups that my organization can work with since everyone has the same goals in mind and can make a big difference together. I will discuss with the board of the nonprofit I work with about having zero-waste events. Lots of ideas for forum speakers and panelists. I was interested concerning content of classes on climate change and building/community sustainability and ensuring we impart this in our course instruction. I made several important contacts who helped me find data I need for my research. I think I may have helped one person connect with a job opportunity. The topics were very interesting and pertinent; I thought the exhibitors were as well; food was delicious; free parking was appreciated; cost was very reasonable. I’m definitely coming next year. Salem Sound Coastwatch You Can Lead the Way to a Healthier Sea and Shore. Solect Smart Solar. Smart Business. Click on a presenter’s name to view a PowerPoint presentation. Massachusetts has often had an important role in American history. In modern times our campuses offer timely research to communities striving for resilience, adaptation to climate change and proactive sustainable development solutions. 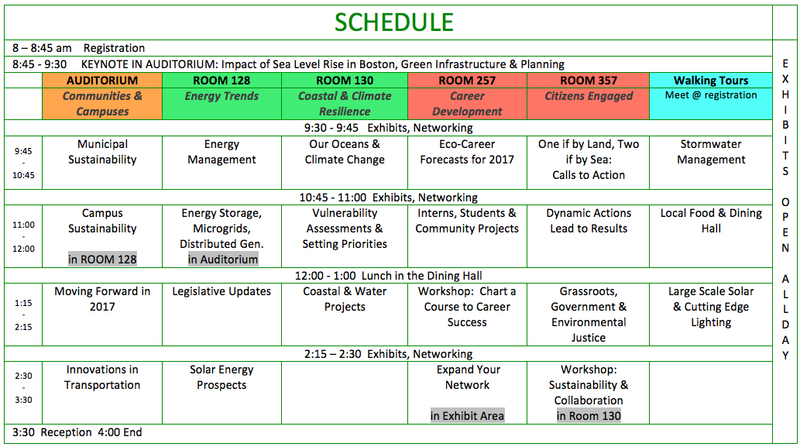 Hear about coastal resiliency and sustainability achievements that leaders are championing in their communities. Massachusetts is one of the preeminent states in energy efficiency and renewables. Learn about best practices, resources, and results. Check out the latest in environmental, conservation, sustainability and climate resilience career trends in: water, clean energy, climate adaptation, food, big data, permitting, facilities management, activism, finance, and more. The language of the Declaration of Independence started at New England town meetings and spread throughout the 13 colonies. Hear about modern day movements that build on our past history. Tour Endicott’s stormwater management systems: rain gardens, detention basins, pervious pavement, and a series of man-made ponds. Learn about emerging energy technologies from experts witnessing and creating the next wave of energy projects in Massachusetts. Directors & consultants describe progress, projects, plans & collaborations on any or all of these: energy, water, food, waste, buildings, pollution prevention, land use, transportation, student & staff engagement, sustainability across the curriculum, how to fund projects, and implementation of plans. Communities spend millions each year on weather-related events. Learn how identifying vulnerable infrastructure issues and prioritizing green infrastructure strategies help them adapt to current and future climate-driven hazards and manage costs. Today’s students own the future. Let them learn and lead the way! Hear about six amazing projects in Massachusetts communities. Discover the latest about natural gas leak mapping, plastic bans, solar installations, interfaith collaborations, and coastal/water initiatives that are sweeping through Commonwealth communities. Learn about a local community-based organization dedicated to local, healthy food. Then visit the dining hall to witness sustainable dining practices on campus. How do campuses & communities fit in with the new federal administration? In 2007 college presidents and mayors signed climate commitments which arose in response to the Bush administration. What will we do in 2017? What’s next and why does it matter? Learn about the role of renewable energy in Massachusetts, job growth, business development, financing, and affordability. Get the facts from the experts. Learn about a range of climate adaptation strategies being implemented in communities. Hear about local natural systems restoration, green infrastructure, and stormwater projects. Set the stage for your next job, whether you are a student, volunteer, career changer, or career advancer. This presentation will encompass goal setting, communicating your value, and asking for what you want when negotiating compensation. People, power and politics drive change. Hear from organizers & experts about solar for low income citizens, and healthy homes and communities. Everyone has a right to clean air, water, and affordable clean energy. Tour Endicott’s 945KW solar parking lot canopy. On the way there, tour some cutting edge lighting installations in a variety of space types, and learn about how lighting has cut Endicott’s carbon emissions even more than large-scale solar. Hear about lessons learned and get your questions answered. Explore multi-modal transportation choices, electric vehicles, and flying transit pods. How we move from one place to another is changing rapidly. Learn about solar for public entities and nonprofits, the link between solar and other carbon reducing technologies, battery storage support for solar projects, and solar careers. Meet exhibitors and other conference attendees. Expand your network. Take time to talk and discuss what is happening. Meet in the exhibit hall. Work through an engaging activity to explore current and future goals for sustainability while taking into account the current political climate to determine constructive and proactive responses. Insights generated will be shared with attendees and via social media. #1: Water Look for strong growth in jobs throughout the water, wastewater, watershed protection, and stormwater management industry. Qualified water industry workers at all professional and occupational levels are expected to be in demand, even before consideration of possible federal infrastructure investments proposed by the new President during the campaign. #2: Clean energy Even with the fossil fuel-friendly energy policies expected from the incoming Trump Administration, there will be continued growth in the clean energy (solar, wind, storage, etc.) and energy efficiency industries. Falling prices and other market forces – in combination with effective policies in many states – are driving consistent expansion. Clean energy and energy efficiency employment nationwide already exceeds 2.5 million jobs, and counting. #3: Retirements Expect a significant increase in the number of retirements at local, state and federal government environmental protection and conservation agencies. Many agencies have a sizable number of employees who are (or soon will be) eligible for retirement. Although these retirements will be met by some modest government hiring increases, many public sector jobs will be replaced by private contractors, and some will not be replaced at all. #4: Climate adaptation Coastal communities, especially, will begin to actually implement aspects of their climate change adaptation plans aimed at preparing for storm surges and other coastal hazards. Unfortunately, sea walls and other shoreline hardening may continue to be preferred over natural (green infrastructure) plans, generating more construction jobs than ecological ones. Activist pressure in support of local green infrastructure policies and ordinances can make a difference here. #5: Food systems Student and job-seeker interest in urban food systems and alternative agriculture is very high, and college/university programs are springing up to serve student demand. It’s hard, however, to see how actual job numbers will match this high interest. We will track this closely in 2017. #6 Big data With the rise of big data analysis possibilities for environmental protection purposes (and the increase in relatively inexpensive data gathering technologies) we’re predicting a shortage of qualified big data analysts with an environmental focus. Those with geographic information systems skills, coupled with outstanding general IT qualifications, will be particularly well positioned. #7 Permitting A long standing equation shows that increases in construction for buildings and infrastructure (expected in 2017) are coupled with increases in work related to environmental assessments and permitting. Expect this to hold true again next year. Certainly one of the best bets for where eco-jobs will be. #8: Facilities management Look for more and more corporate, academic and municipal sustainability assignments to be incorporated into the job descriptions of existing facilities management and/or Environment, Health and Safety (EHS) staff. 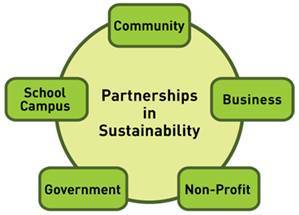 Community colleges and job training organizations may be called on for “green up” training of existing personnel. We expect desired qualifications for sustainability positions to become even more sector-specific than they are now. #10: Activism Rapid changes in the political, demographic, financial and technological landscape require new approaches to campaign organizing, membership development and fundraising. Nonprofit environmental managers/professionals with proven, recent successes that combine mastery of social marketing and social media strategies with old-school approaches, will be in high demand. #11: Financing Demand is already strong for professionals who can craft innovate public/private partnerships and other creative financing arrangements to pay for environmental improvements. This demand will increase in the face of continued budget constraints and uncertainty at the federal level. Financing expensive water and stormwater management infrastructure improvements is one example of a common challenge in need of innovation. #12: Summary The nation has never needed a talented and passionate environmental professional workforce more than it does in 2017. For those already employed, we will need all of your energy and creativity. For students and job seekers, best of luck to you. I’m grateful that a new generation is arriving to take on this critical work.